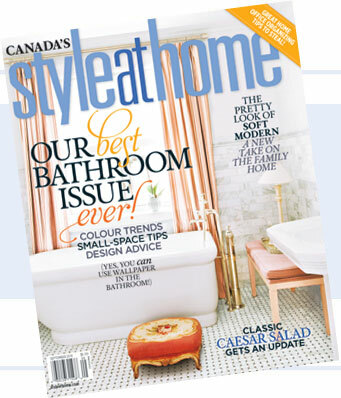 So, the time has come my friends, I'm excited to share that I'm in the September issue of Style at Home magazine. I haven't held a copy in my own hands yet but two lovely people, Tracey Ayton (awesome photographer) and my sweet Mom both sent me pics. Congrats...cant wait to see it!!! Congratulations, friend! So excited for you!! Beautiful photo (no surprise there! :)) I need to get my hands on a copy of this somehow in NY...Congrats!!! Cute pic! Looking forward to seeing the story. Ha ha! Tracey doesn't have a copy either - I sent her photos from my iPhone last night! I can't believe they don't send you a copy before everyone else. I simply adore your home Erica - you are so talented. They space looks so pristine - hard to believe there are 5 boys in the house! Beautiful work. I'm super happy we got to shoot together and I think all the hard work paid off. You deserve this and I'm honored to have had the opportunity to shoot it. Bask in the attention!!!! High FIVE sister! That is so well deserved! I have a subscription on my iPad- can't wait to see your place!!! Erica - just received my copy in the mail today (and live in YYC). I've been following your blog for a while now and love to see pictures on printed paper. It is beautiful - as are you and your family. I need to hire you to decorate my home. Congrats! I was delighted to see your home featured. So beautiful. Congratulations, Erica! You totally deserve this!! I hope I can get my hands on a copy here in NY, too! :) Enjoy this time. I hope so much that my copy arrives today! I love your style and your boys are so sweet! Your home is BEYOND Erica...every single detail is perfection!!! I absolutely poured over every photo and every word. As for the bestest part though, you 5 boys are amazingly precious and you my friend are stunning. I love your upholstered bed frame in the magazine....where did you get it?